Ahhhh….this Mint Chocolate Chip Buttercream frosting recipe is one of my all-time favorites! 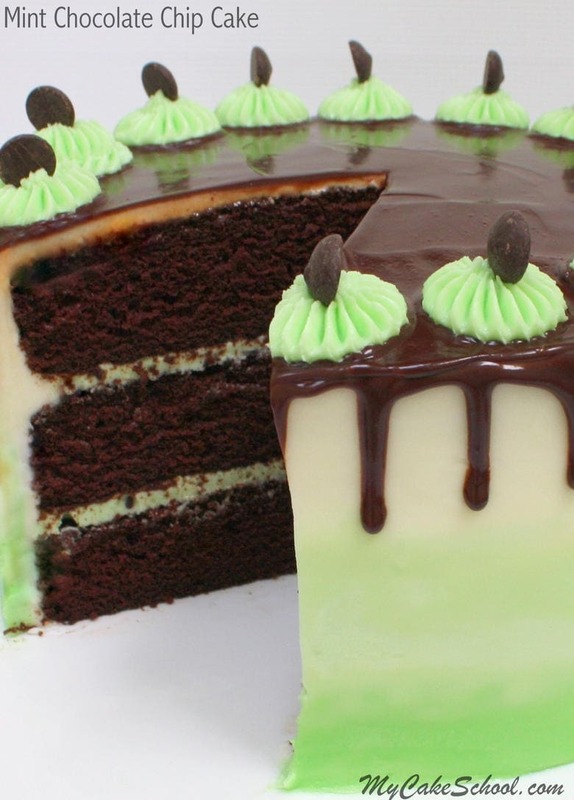 In my book, the combination of mint and chocolate is absolute perfection, and so it only stands to reason that Mint Chocolate Buttercream would be out of this world! SO good. 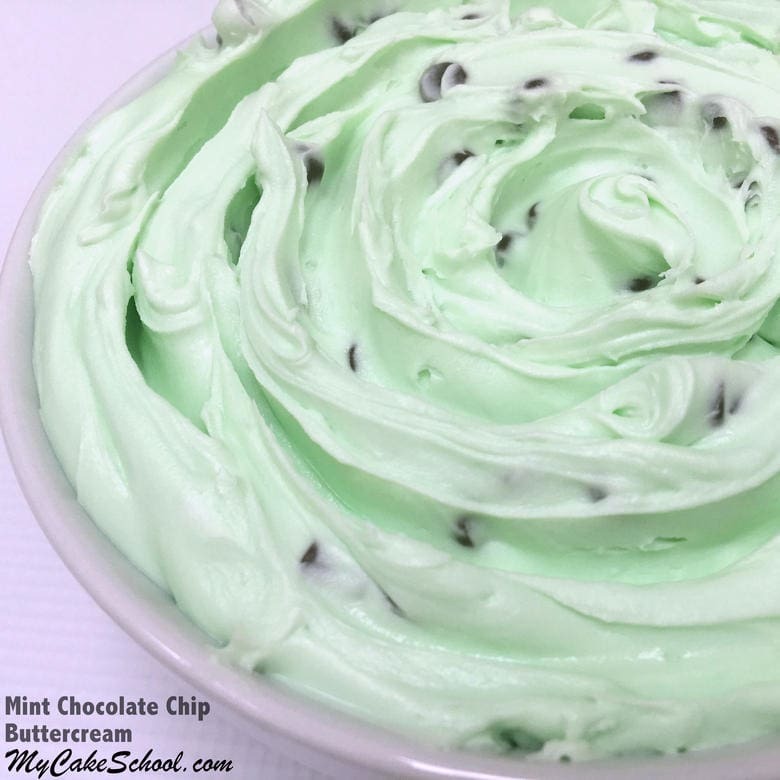 The only thing better than a bowl of this mint chocolate chip frosting and a spoon, is a chocolate cake or cupcake (or chocolate cookie or piece of chocolate anything) swirled generously with it. Mmmmm. If you like mint chocolate chip ice cream, you’re gonna love this. 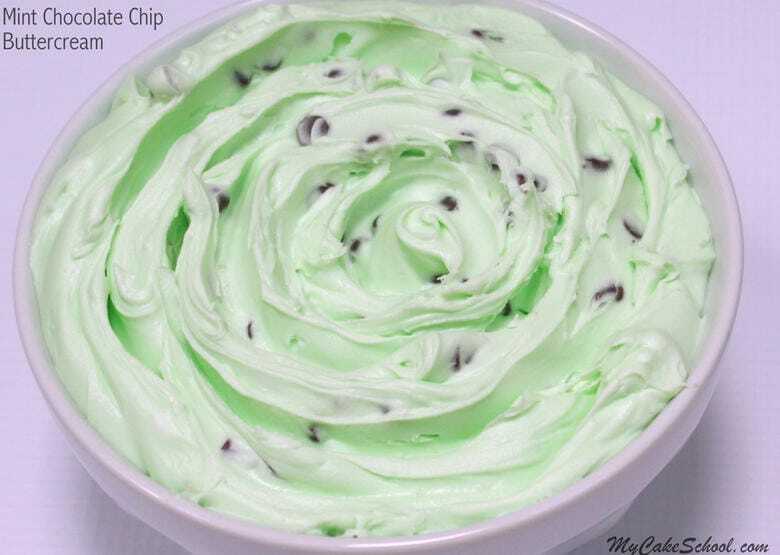 Feel free to do a little experimenting with mint extract if you’d like, but for me, THIS is what Mint Chocolate Chip Buttercream should taste like. For extra easy smoothing, you can leave out the mini chocolate chips for the outer frosting, and simply add chips to the filling when making a mint chocolate chip cake. The mini chips do make piping tricky unless your piping tip has a very large opening. While I often leave out the chips when frosting the outside of the cake, it can be done! You may just need to apply the frosting a little thicker than usual so that the mini chips can be more easily smoothed into the frosting as you make your way around the cake with your bench scraper. As with most of our American Buttercreams, this recipe develops a slight crust and is so simple to make! You’ll love the silky smooth texture, and of course the mint-chocolatey flavor. Beware, this frosting is highly addictive! Enjoy! Cream the softened butter until smooth. Blend in the peppermint. Add half of the powdered sugar and most of the milk. Beat at medium speed until the powdered sugar is incorporated. Add remaining powdered sugar, milk, coloring gel, and mix at medium speed another 3 to 4 minutes scraping the sides of the bowl occasionally. The texture will become very smooth. Stir in desired amount of mini chocolate chips! Soooo good! ** We’ve had great results with Domino’s confectioner’s sugar and US Sugar (we buy ours from Costco). Some brands of confectioner’s sugar don’t work as well with buttercream frosting recipes. If a package doesn’t say pure cane sugar, it contains beet sugar which is more likely to give you a grainy outcome. In addition to that, we’ve noticed that even some brands that say “Pure Cane Sugar” will give a grainy consistency. So frustrating! One example is Dixie Crystals (although it used to work great for us a few years ago.) Something has changed…it’s a mystery. Anyway, this recipe should not be grainy, and so if it is, experiment with a different confectioners sugar. Around the holidays, you may like to experiment with peppermint buttercream (pretty much the same as this recipe, lol) for a festive candy cane cake! Thanks for stopping by! Don’t forget to check out our full collection of our favorite tried and true cake and frosting recipes in our Recipes Section! Also, we have a fabulous collection of Free Step by Step Cake Tutorials in our Free Tutorials Section! Hi Agnija— Yes, T is tablespoon. This is absolutely delish and tastes like ice cream! Hi Kerry, I think we used the Fluffy Vanilla Buttercream frosting that is in the recipe section. It has a small amount of butter but still makes a nice white frosting. The High Ratio Frosting recipe has no butter so will be a shade lighter. When making the frosting be sure to use clear vanilla extract. Hope this helps. Yes, it is a crusting buttercream. How long can a cake with this icing sit out at room temp? Hi Kelly, We think 3 days is the maximum for this buttercream, after that time it begins to have an “off” taste. If the cake is in very hot and humid area, the time will be shorter. Hi, can I use this buttercream on chocolate cupcakes ? will this be ok to go under fondant?